Be the first to share your favorite memory, photo or story of Charles "Chuck". This memorial page is dedicated for family, friends and future generations to celebrate the life of their loved one. Charles "Chuck" Leander Martin Beers, 87, died peacefully at home in Bozeman from liver cancer on March 14, 2019, surrounded by his family. Chuck was born on August 23, 1931 in Great Falls, Montana, the third child of Charles Leander and Mabel Arnegard Beers. Raised in Judith Gap, he graduated as the valedictorian of his high school class in 1949. 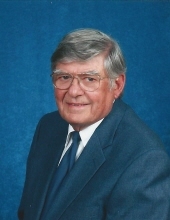 He was a member of Lambda Chi Alpha fraternity and graduated from Montana State College in 1953 with a BS degree in Agriculture, while also earning his Air Force Reserve Officers Training Corps certificate. In 1954, he married Barbara Parker and together they had three children. In the same year, he began his flying career in the Air Force graduating with Pilot Training Class 55-E at Vance AFB, Enid, OK, traveling the world, moving to many different locations, and specializing in aerial re-fueling operations. After retirement from the military, Captain Beers flew 27 years for World Airways. Remarkably, while in the USAF and with World Airways, he flew 284 successful missions over South Vietnam and South East Asia. He was recognized and awarded by the USAF for these missions and was referred to as being "a fighting man and a professional." Chuck loved to hunt, fish, bowl, golf, water ski, and ride both road and dirt motorcycles. He enjoyed football and was an avid Oakland Raiders fan while stationed in California. Traveling to every continent except Antarctica, he found his favorite places were Hong Kong for the shopping and Germany at Oktoberfest for the beer and food! After retiring in 1995, Chuck returned to Montana where he enjoyed rodeos, festivals, craft fairs, and people watching. As a life member of the Montana State University Alumni Association, he was committed to MSU students by volunteering for "Move-In Day" and supporting the Bobcat football and rodeo teams. The many life-long friendships Chuck built throughout his years of service made a tremendous impact on his life. He was a dedicated member of the Fraternal Order of Eagles Aerie #326 in Bozeman for over two decades. He held all the different chairs of the local Aerie and he was serving a state office as Chaplain at the time of his passing. Chuck was also devoted to the Montana Masonic Family for many years. He was a Past Master of Belgrade Lodge #68, and also a very active member and dedicated officer in Judith Lodge #86, Bannack Historic Lodge #3-7-77, Scottish Rite, Algeria Shrine, Jesters, and the Vigilante Masonic Welfare Association. He was a member of the American Legion China Post #1 for 45 years and the Veterans of Foreign Wars. In all these organizations Chuck served the community in countless ways, assisted with numerous charity fundraisers and enjoyed a variety of activities. His children remember him as a quiet, gentle, and generous man who encouraged them to pursue their dreams and enjoy life to the fullest. Chuck is survived by his children, Leanne (Jon) Kramp of Rancho Cordova, CA, Randy Beers of Long Beach, CA, and Robert (Debbie) Beers of Beaverton, OR; his grandchildren Melinda Dougan of Beaverton, OR, Jordan (Abigail) Beers of Aloha, OR, and Lauren (Tim) Riley of Springfield, OR; and numerous nieces, nephews, and cousins. He was preceded in death by his parents, "Lee" and Mabel Beers, and his sisters and brothers-in-law, Rosa Lee (Johnny) Lea and Barbara Kay (Joe) Kirscher. The family would like to lovingly thank Keven Comer, FNP, and her staff (specifically Lauren) for their devotion to his care. To the staff at Hospice of Bozeman Health and Qualicare Home Health Bozeman they are grateful for their compassionate assistance. Chuck's children especially express gratitude and appreciation to their cousins Keith and Robin Kirscher for walking by their side every step of the way. All are welcome to attend the celebration of Chuck's life on June 8, 2019 at 3:30pm at Dahl Funeral & Cremation Service Tribute Center, with a reception to follow at the same location. The internment will be held on June 9, 2019 at 11:00am at the Judith Gap Cemetery, with a reception to follow. In lieu of flowers, Chuck requested donations to Algeria Shriners Children's Transportation Fund. Please mail to Algeria Temple, PO Box 1174, Helena, MT 57624. Thank you! To send flowers or a remembrance gift to the family of Charles "Chuck" Leander Martin Beers, please visit our Tribute Store. A Celebration of Chuck's Life. Guaranteed delivery before Charles "Chuck"'s service begins. Guaranteed delivery before Charles "Chuck"'s graveside begins. "Email Address" would like to share the life celebration of Charles "Chuck" Leander Martin Beers. Click on the "link" to go to share a favorite memory or leave a condolence message for the family.